Part of my plans with getting back to Chicago are blog-based; namely, I want to get back to where I was pre-California. Posting daily, with weigh-ins on Fridays, a new recipe every week, etc. I owe so much of my initial success to blogging, to the accountability I found by posting here, and I know that it will be crucial with getting back to successfully losing weight. I have really big plans for the next few months, and can't wait to share them as they get sorted out! For now, a recipe, because I haven't shared one in forever: a delicious baked egg and vegetable dish. I've been seeing eggs in so many forms on different blogs and Pinterest: crust-less quiches, frittatas, the little Paleo egg cups made in muffin tins. I looked at a ton of recipes, then sort of threw my own mix together. It worked, and I've since made this a few times a week. Perhaps I'm strange, but I like eggs hot *or* cold, so I usually make it in the morning and stick it in the fridge so lunch is ready when I get home from work. It's just as good hot, though, if that's your preference. 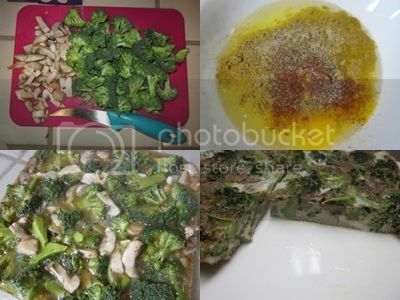 Preheat oven to 350º F. Take 2 cups of veggies and chop them up - I do 1/2 cup mushrooms, 1 1/2 cups raw broccoli. In a separate bowl, whisk together 2 eggs and 7 egg whites with whatever spices you would like - I like salt, black pepper, chili powder, and cumin. Mix it all together and pour into a 9x9" baking dish that has been sprayed with cooking spray. Bake for 25 minutes or until set. The whole dish is under 350 calories with lots of protein. It could easily serve two people, but I typically have Greek yogurt and fruit for breakfast at 7 a.m., a handful of almonds for a snack at 11 a.m., and get home around 2 p.m. pretty hungry. I'm still readjusting to teaching in the morning (I taught evenings 5-6:50 p.m. for the Spring semester). I think what I like best about this is that it's really versatile - mix up the veggies in a few different ways, add cheese or maybe some meat if you wanted, vary the spices. I can't wait to make this for Matt when I get back to Chicago - if you recall from last summer, he's a notorious veggie hater, and I think this might be a good way to get more veggies into our eating plans. He also doesn't cook anything more complicated than oatmeal; I've started a board on Pinterest of things we can try and cook together. And speaking of Matt, I'm so proud of him - he's lost 65 pounds, and ran a 10 mile race this morning! He was a bit disappointed with his performance, but it was his first race longer than 10K, and long races are a whole different challenge. He's never ran with gels, for example - fueling mid-race is not necessarily tricky, but figuring out nutrient timing is very much a trial-and-error sort of experience. All things considered, I think he did a great job - just finishing is something to be proud of! We're both signed up to run a half marathon in July and he's a bit discouraged after this morning, but I still have faith he'll be able to do well at the half! What about you? Do you like cold eggs? What are your favorite recipes for converting veggie haters? What's your favorite racing distance? I have never posted on your blog before but I really love reading your entries. I can relate to so much of what you write. I grew up in Libertyville, IL (one of the many suburbs of Chicago). I spent the majority of my early adult years in Mnpls, MN. In August of 2009 we moved to Southern California. So I have lived that whole adjustment thing with the lack of 4 seasons and a different lifestyle. Plus I have lost 61 pounds in the past 18 months (on WW mostly). I now run 5K's, 10K's, and I'm signed up for a mud run next month. Can't wait! And we still toy with moving back to MN someday so I can really relate to the feelings you've had lately about going back to the place where you feel most at home and genuinely makes you happy. CA has been a treat in some ways but it isn't the Midwest and we really want to raise our 4 children in the Midwest if possible. I'm looking forward to trying your egg recipe. I just came home with 5 dozen eggs from Costco! :) They'll probably only last 2 weeks though. I'm not sure that I have tried eggs cold other than a hard boiled egg. The recipe looks interesting. 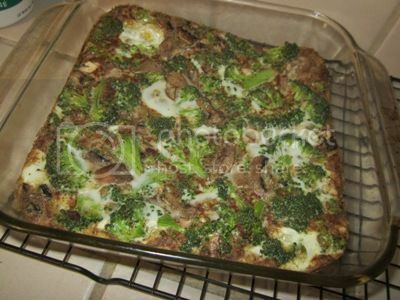 John and I have been making some egg recipes lately including a crust-less quiche with bacon, mushroom and Swiss, a quiche with a crust, broccoli, roasted red pepper and cheddar and also an egg casserole with hash-browns, egg beaters, and turkey sausage. All have been delicious. I'm glad to see you excited about finding ways to cook healthy (vegetables) with Matt, it inspires me to do the same with my man. He likes most vegetables, but has a hard time with fruit. I think he only likes apples so far. We're working on oranges right now. I read the other blog, and I totally and completely agree with you that lasagna is better when reheated the next day. It's like everything has a chance to "settle", especially the cheese. Yum! I am not the biggest egg fan but lately I've been eating them a lot. So many different recipes out there. This one is being added to my recipes to try. Congrats to Matt! That's so awesome. The thing he needs to remember is that perhaps a year ago he maybe couldn't even run a 5K and now he is doing 10 miles. Kudos to him! I pretty much eat that dish every work day :) I make a dish on a Sunday night and eat it for work lunch Mon - Thur. Great cold, yum. What do you do with the yolks of the seven egg whites you use? That is so much food for only 350 calories. That's fantastic. I don't hate vegetables. I just hate eating them. The Spanish have a dish called a tortilla (which is not like what we make tacos or burritos with) that is a cold egg dish. It is usually onion and potato with egg cooked in a skillet and served cold. It is incredibly delicious and served generally as tapas, but sometimes as a light meal. I love cold eggs. Nothing beats a cold egg chopped up and put in a roll.